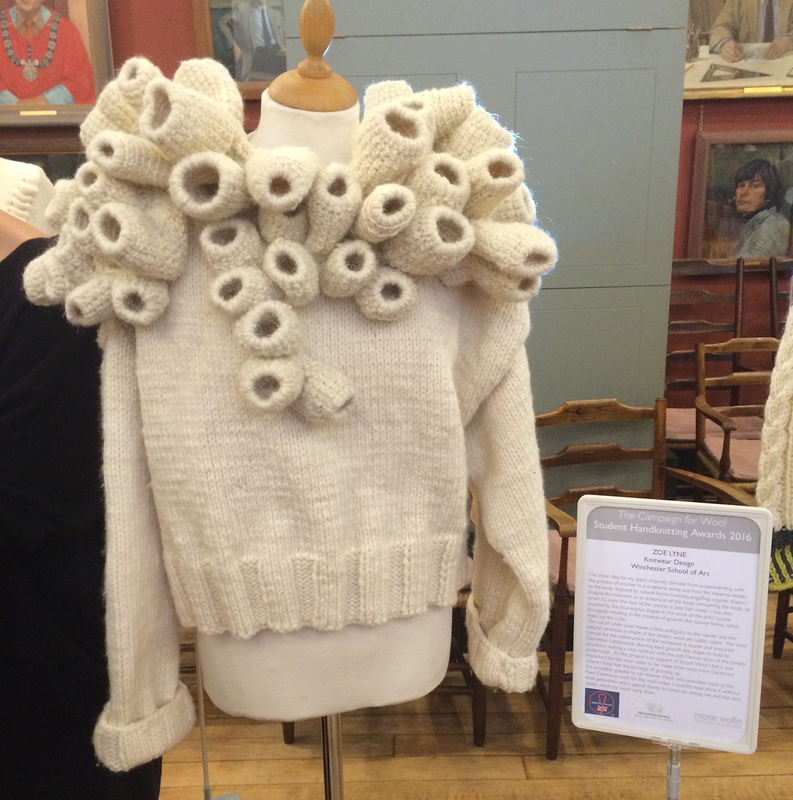 Two Knitwear students, Zoe Lyne and Jessye Boulton won prize’s at the Campaign for Wool Student Hand Knit Competiton held at Artworkers Guild Hall in London during Wool Week. The students responded to a competition brief created by Marie Wallin. Students were asked to design a series of fashion garments hand-knitted in 100% wool, or wool-rich, [more than 51% real wool] that displayed sculptural form using cabling and 3D knitting techniques in a palette which celebrated the colours of a British Autumn. Students were encouraged to incorporate other handcraft techniques such as crochet, macramé, tatting and felting. The brief asked for an exploration of scale as a means to create drama and complexity. Sixteen final entries were judged during Wool Week by Marie Wallin, Bridgette Kelly of The Campaign for Wool Ltd, Wendy Barker ofKingston University and Polly Leonard, Founder and Editor of Selvedge Magazine who awarded a special prize to her overall preferred entry. Using the colours of Autumn as her starting point Jessye created a highly textured garment using Spring stitch to mimic the natural complexity of the forest floor and to celebrate the quality of the pure wool yarns she used. Jessye secured yarn sponsorship from Cornish Organic Wool and LoveKnitting.com which enabled her to create a dense and luscious final piece. Zoe was inspired by the notion of an organic shape engulfing the wearer for her design. Imagining knitwear as an extension of the body Zoe constructed the garment to obscure the face with a series of sculptural tube-like forms that form the collar. The garment was hand-knitted in natural undyed British and Merino wool specifically to subtly draw attention to the natural irregularities in the yarn. Constructing the sculptural collar in Dartmoor lambswool, supplied by Lily Warne Wool, was a nod to Zoe’s Devon heritage. Congratulations to Jessye and Zoe! 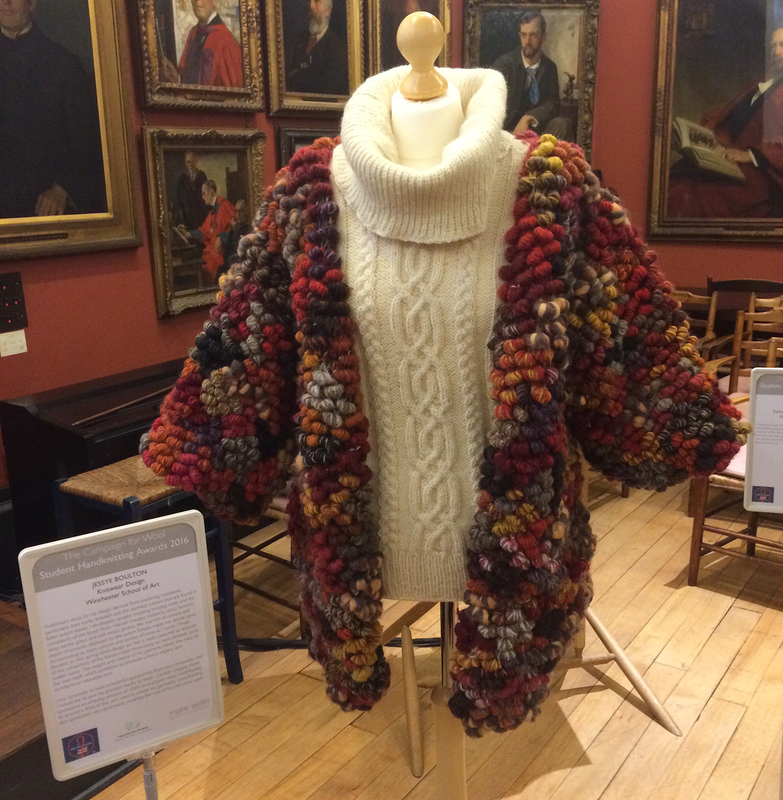 This entry was posted in Fashion & Textile Design, Textiles and tagged Campaign for Wool, competition, Jessye Boulton, Knitwear, Knitwear for Fashion, Prize, Prize Winners, Winchester School of Art, Zoe Lyne by Caitlin Hinshelwood. Bookmark the permalink.